Mobile messaging app WhatsApp has rolled out a new feature that allows users to create a private backup of their chat messages & data on Google Drive. "So starting today, WhatsApp for Android lets you create a private backup of your chat history, voice messages, photos, and videos in Google Drive," Scott Johnston, director of product management, Google Drive, announced the feature in a blogpost. While the Facebook-controlled WhatsApp always provided local backup of messages, the new feature will help in restoring data from lost/stolen devices. "Google Drive was an easy choice. It offers the native Android experience we want for our users and the scale to grow with us," Brian Acton, co-founder of WhatsApp, said in a statement. 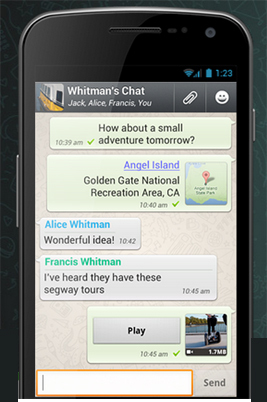 The new feature will appear as a prompt once the user updates to version 2.12.303 of WhatsApp. While this is the version hosted on WhatsApp's website, the Play Store version is a different one. In fact, the Play Store version (2.12.304) has Drive support disabled and hence the functionality won't be applicable for those using the most recent version, as per a report by Android Police. "The new backup feature is rolling out over the next few months, so keep an eye on your WhatsApp settings to see if it's available," Johnston added. As on September 3, WhatsApp had a global active user base of 900 million. WhatsApp counts India, Brazil, Mexico and Russia among its largest markets. It is quite likely that WhatsApp has over 100 million users in India. In November 2014, WhatsApp said it had 70 million active users in the country. According to a recent report by global consultancy firm TNS, WhatApp is the most popular instant messaging (IM) platform in India as it covers 56 per cent of all instant messaging users here. WhatsApp competes with the likes of Hike, Facebook Messenger, Viber, Google Talk, China's WeChat, Japan's Line and Nimbuzz in India. In October 2014, social networking giant Facebook acquired WhatsApp for $19 billion.